Here’s what someone once said about Nancy Pelosi: “She’ll cut your head off and you won’t even know you’re bleeding.” That quote came from Pelosi’s own daughter. The current Speaker of the House is so politically savvy, calm, and collected, she can do a lot of damage to her opponents while smiling the entire time. Here’s the thing. Pelosi is no longer smiling. Not even close. When Nancy Pelosi became Speaker of the House earlier this year, she said that impeaching Donald Trump at that time wasn’t worth it, and she’d wait until the Mueller probe and/or other investigations turned up more about Trump’s crimes. It was a wise move. If she’d pushed forward with impeachment three months ago, it would have gotten through the House but certainly not the Senate, and all it would have done was make Trump more emboldened. So Pelosi has held her fire, preferring to let the House committee chairs push forward with their probes, all while waiting for Trump to hand her an opening. He just did. 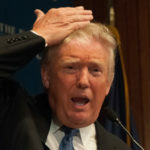 Trump’s Attorney General William Barr thumbed his nose at Congress about the Mueller report yesterday, while repeating one of Trump’s most deranged phony conspiracy theories. Then Trump’s Treasury Secretary Steve Mnuchin thumbed his nose at Congress as well when he announced that he was illegally refusing to turn over Trump’s tax returns. These two scoundrels just declared war against American democracy, on Trump’s behalf. If Trump wants a war, and he clearly does, Nancy Pelosi is going to give him one. When she spoke before the cameras yesterday and accused Barr of having gone “off the rails,” you could clearly see from her tone and body language that Trump and his stooges had crossed her red line. Nancy Pelosi is as ethical as they come. But she can hit far more effectively below the belt than a one-note con man like Donald Trump ever could. In his rush to cast aside all semblance of democracy and the rule of law since he falsely exonerated himself, Trump has made the mistake of awakening the monster of overwhelming public desire for his illegitimate presidency to end. Pelosi has just been handed her opportunity to justifiably finish him off – and while we’ll see how she goes about it, there’s no doubt she’ll seize the opportunity.